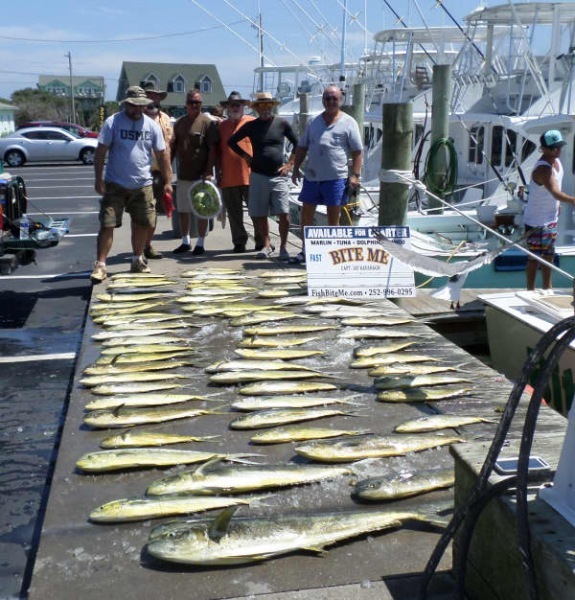 Inshore boats took the lead today with several fishing despite winds. 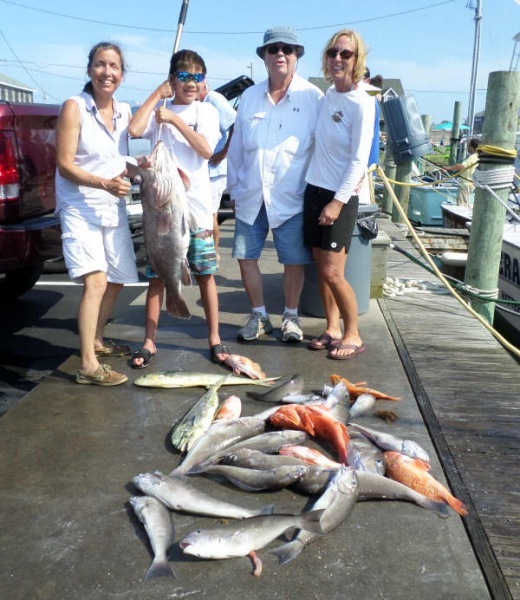 They fished both morning and afternoon catching Spanish Mackerel, Bluefish, Black Drum and releasing Red Drum. 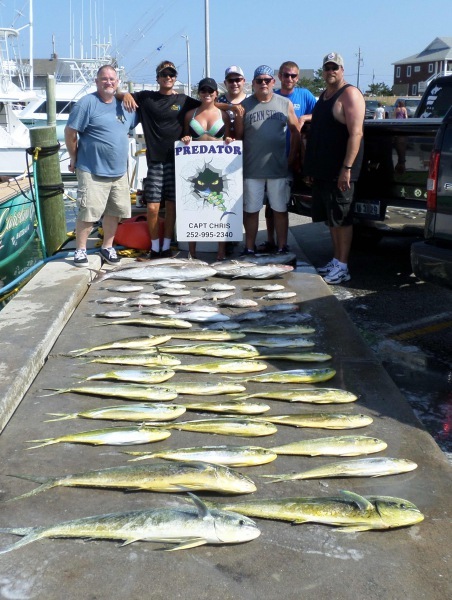 There were even a few small Dolphin caught on a half day Inshore trip. 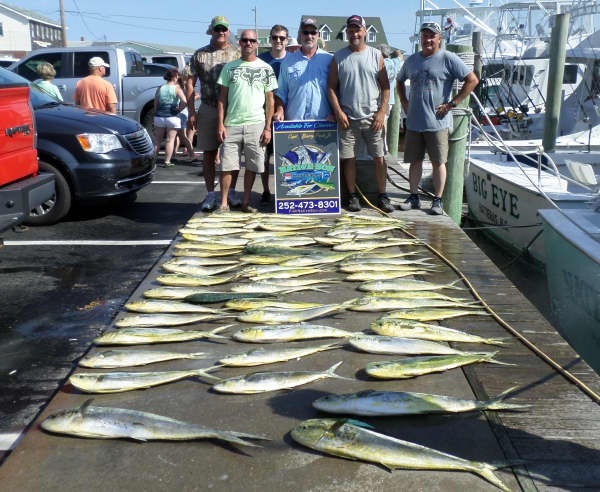 Offshore most boats were fishing the Hatteras Marlin Club tournament. Good Times released a Blue Marlin. Tuna Duck released 2 Sailfish and a Blue Marlin. The rest of the fleet also had lots of Dolphin on the dock. Tradition: Taylor Wilson of Windsor, NC released a 40", 43", and 46" Red Drum. Randy Wilson of Windsor, NC released a 40" and 47" Red Drum. 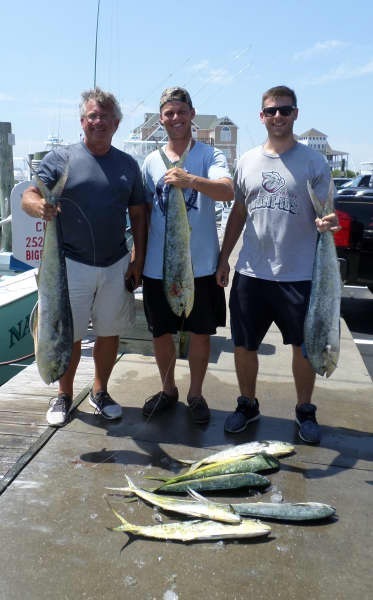 Good Times: Robert Stella of Westminster, MD released a Blue Marlin. Tuna Duck: From Browns Summit, NC Mark Roy released a Sailfish and a Blue Marlin. TJ Roy released a Sailfish. Weather was windy today and all boats stayed at the docks. Southwest winds and a big sea kept most offshore boats at the dock today. 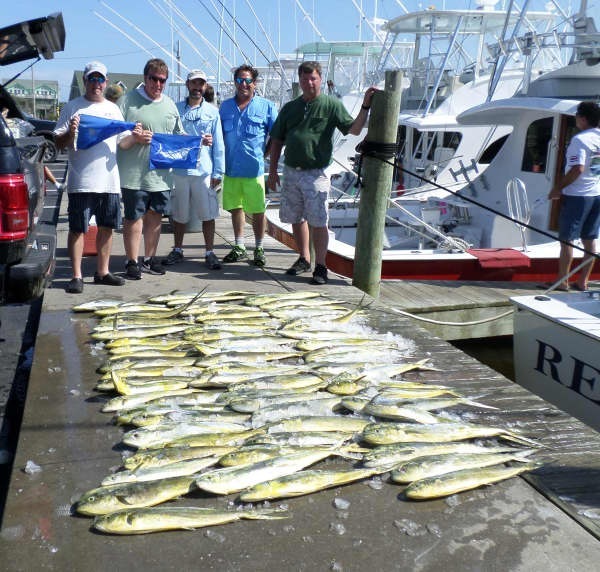 Two boats went out to the Gulf Stream and returned earlier than usual with limits of Dolphin. Release released two White Marlin. 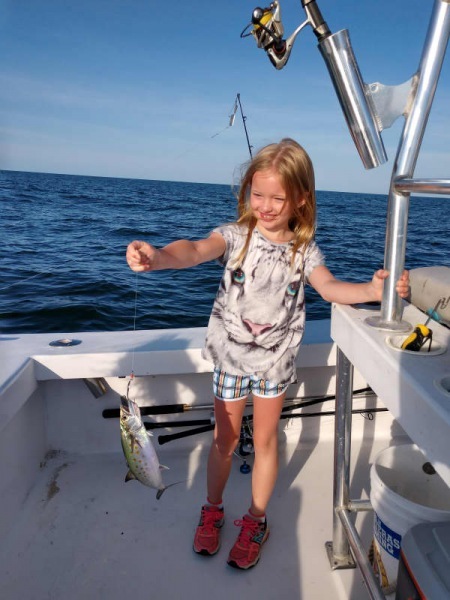 Inshore boats that went out this morning returned with good catches of Bluefish, a few Puppy Drum, and a good catch of Spanish Mackerel. Let's hope the wind falls out and fishing will resume as our fleet is booking up for the Summer. Don't miss out - give us a call at 800-676-4939 and we'll hook you up! Wesley Mills of Concord, NC: White Marlin release on Release. 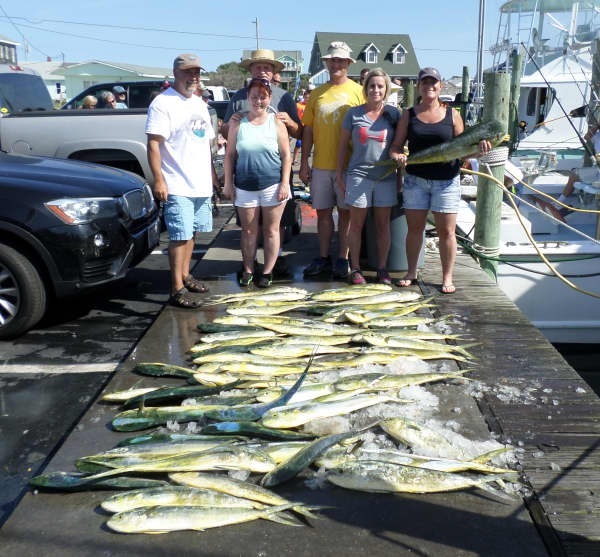 Howard Shipwash of Concord, NC: White Marlin release on Release. The Summer crowd is here and ready to fish! 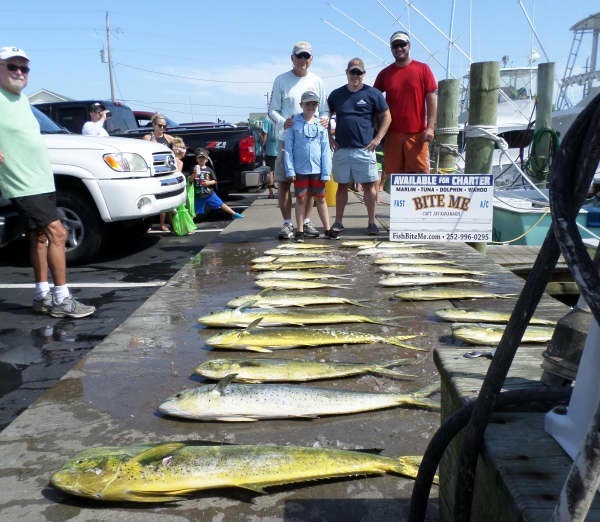 Inshore boats entertained anglers today and got them onto Bluefish, Spanish Mackerel, and Red Drum. 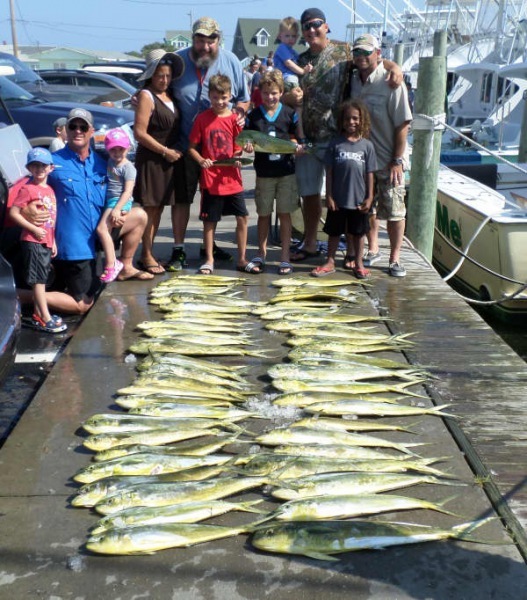 Some family groups went out (including youngsters) and received some instruction on types of fish, and how to hook and reel in fish. It really is educational and very hands on! 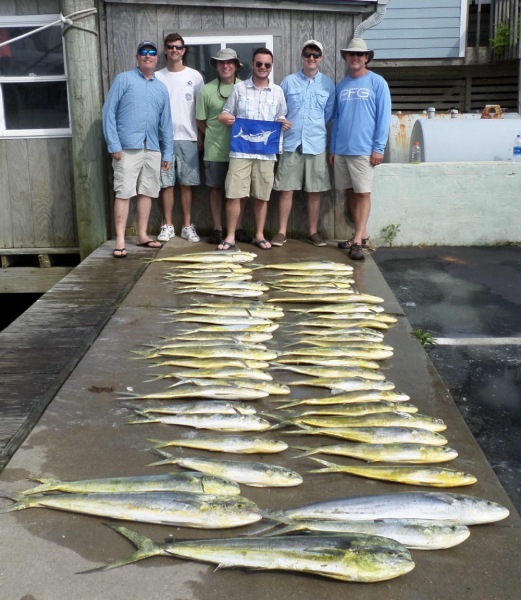 Near shore anglers returned with good catches of Spanish Mackerel. Most of our offshore fleet ventured to the Gulf Stream and five Billfish were released today. The Dolphin bite was fair. 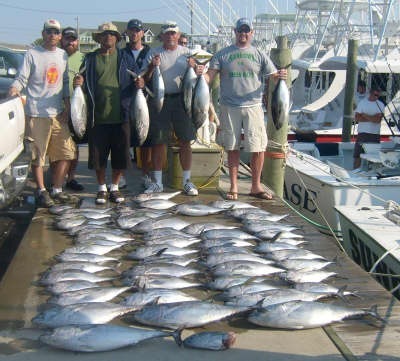 Add in a few Wahoo and a few Blackfin Tuna for some nice variety. 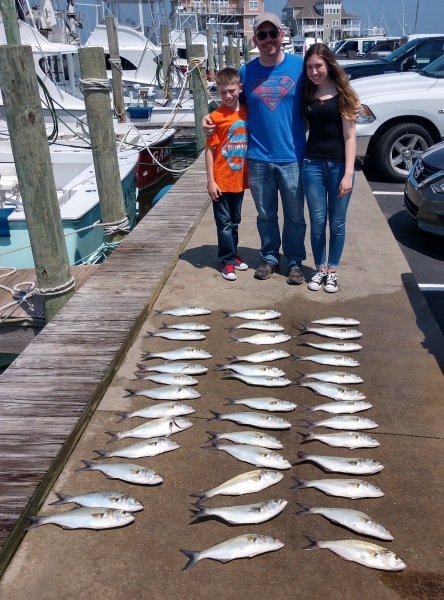 King Mackerel are still hanging around and help to fill the fish box. 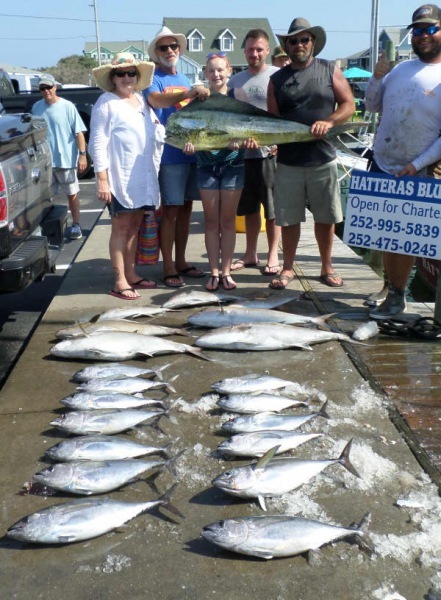 A Rainbow Runner ( a member of the Jack family) was caught as well. 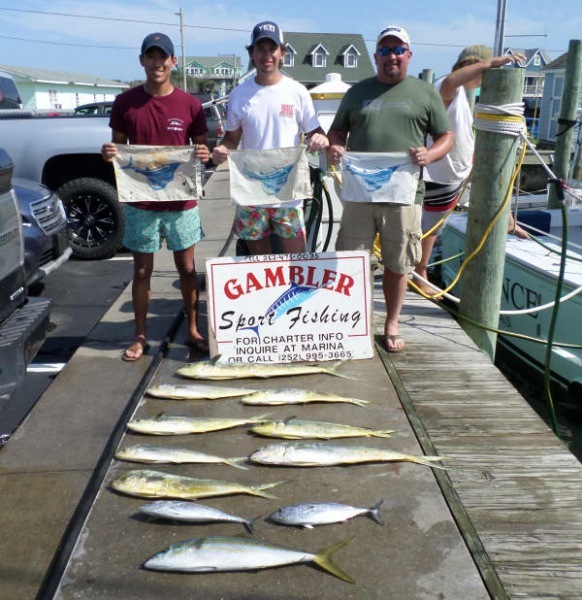 Jeffrey Hummel of Bethlehem, PA: Sailfish release on Gambler. Garrett Richards of Coplay, PA: Sailfish release on Gambler. 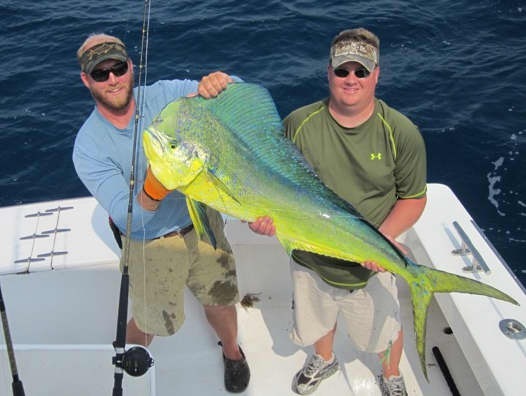 Scott Richards of Coplay, PA: Sailfish release on Gambler. Robert Piorkowski of Statesville, NC: 41" Red Drum release on Tradition. 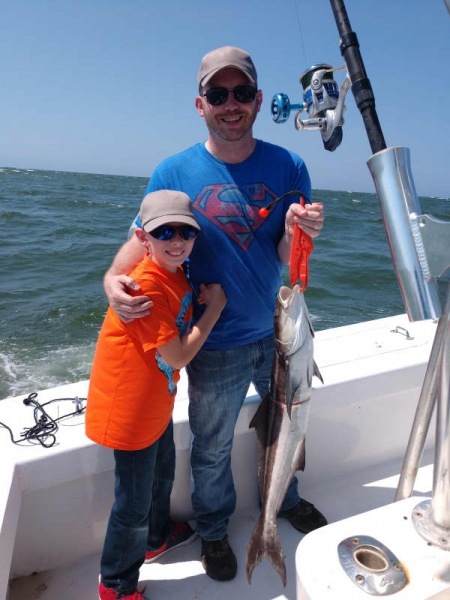 Edward Karopchinsky of Beaverdam, VA: Sailfish release on Sea Creature. Henry Felder of Durham, NC: 33 lb. Grouper on Good Times. 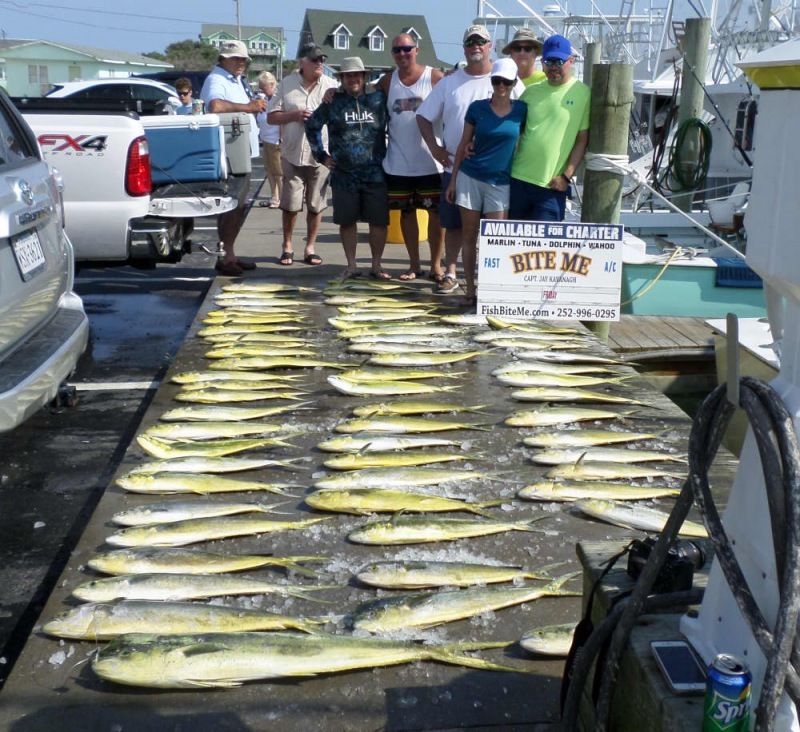 On this first day of Summer ouf fleet stayed busy getting anglers out to the fish. Inshore anglers went after Cobia this morning and afternoon. The Bluefish bite was on this morning but slowed down this afternoon. 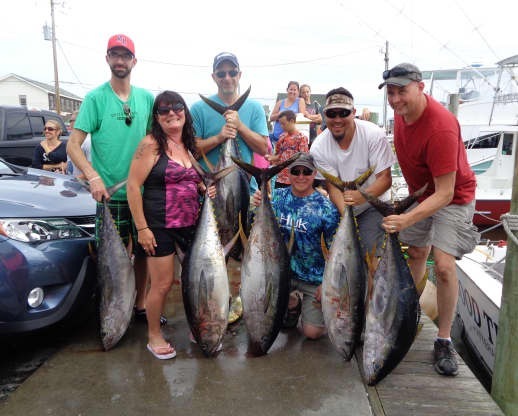 A group got on the Drum and were quite taken by catching them on light tackle. 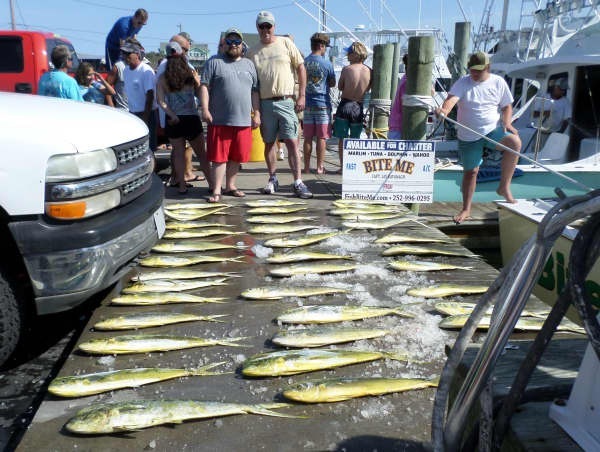 Some Spanish Mackerel were caught just before returning to the dock. 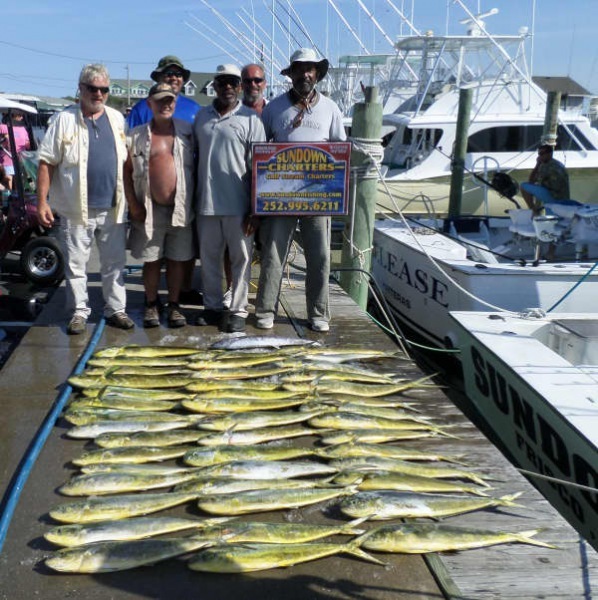 Dolphin was the name of the game this afternoon with anglers returning from the Gulf Stream with limits. One Sailfish was released. 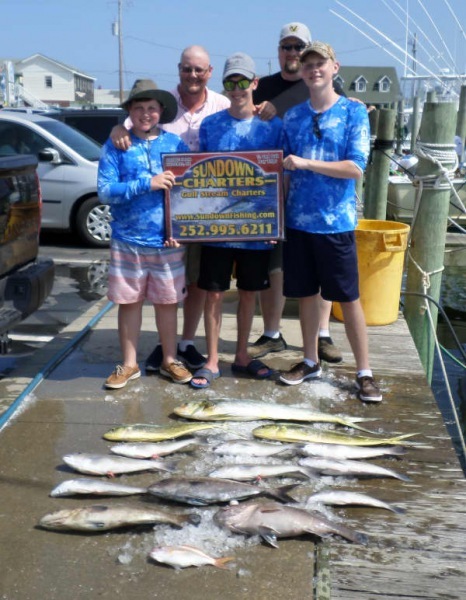 We have some openings this weekend, so don't miss out this Summer -give us a call a call at 800-676-4939 to book your next fishing adventure. 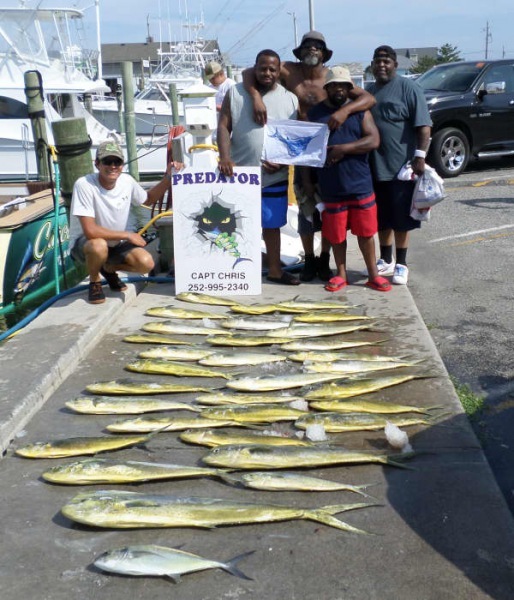 Citation:Calvin Simonds of Charlotte, NC: Sailfish release on Predator. 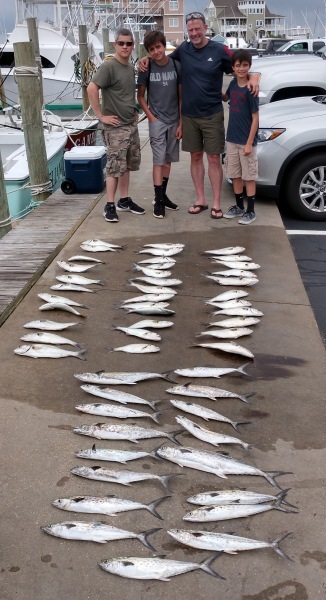 Spanish Mackerel were plentiful on the soundside this morning and on the ocean side this afternoon. 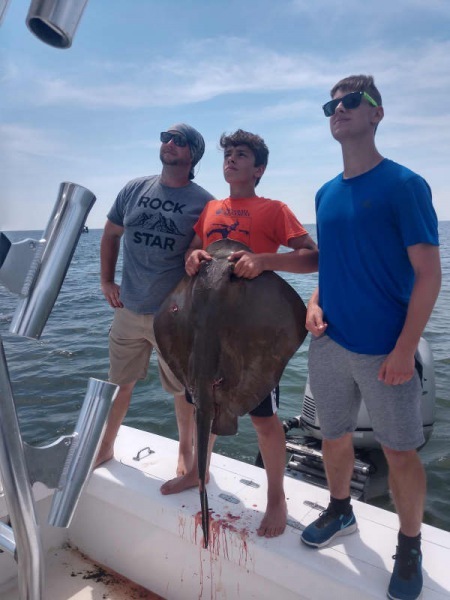 The Bluefish bite was good this morning and sharks were reported at the point in Buxton. Most of our fleet fished offshore and experienced a good Dolphin bite. 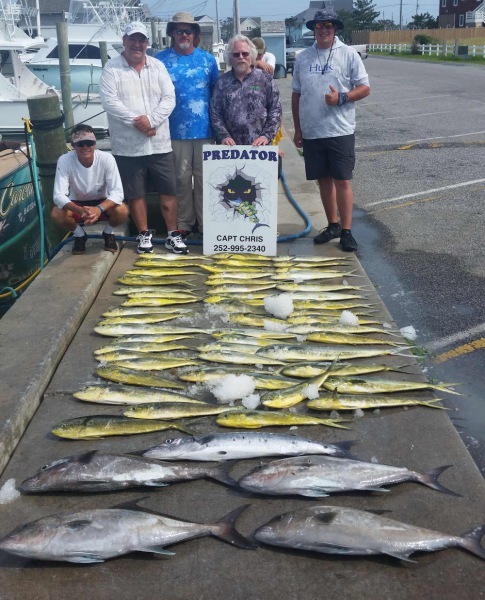 The Wahoo and Blackfin Tuna bite was scattered. 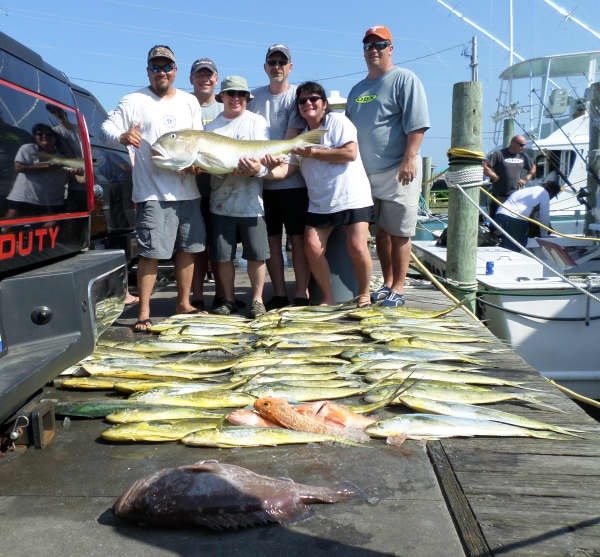 Bottom fishing was pretty good today with Triggerfish, Black Sea Bass, Tilefish, Gag Grouper. Snowy Grouper, and Longfin Basslet. Three billfish were released by very lucky anglers! 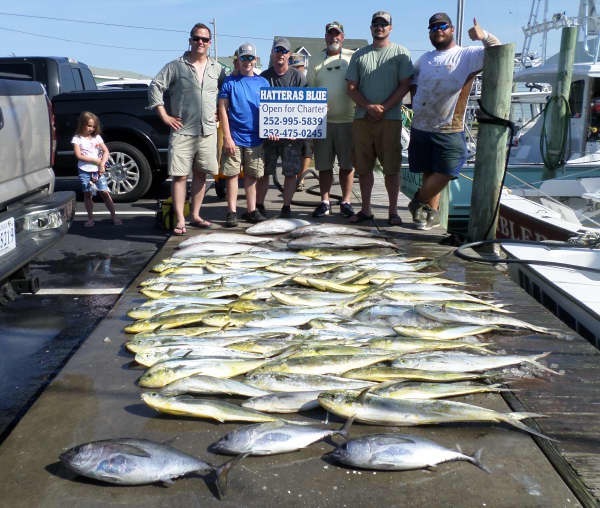 It was an extremely hot day and anglers reported a slight breeze offshore that made it all better - that's one way to beat the heat! 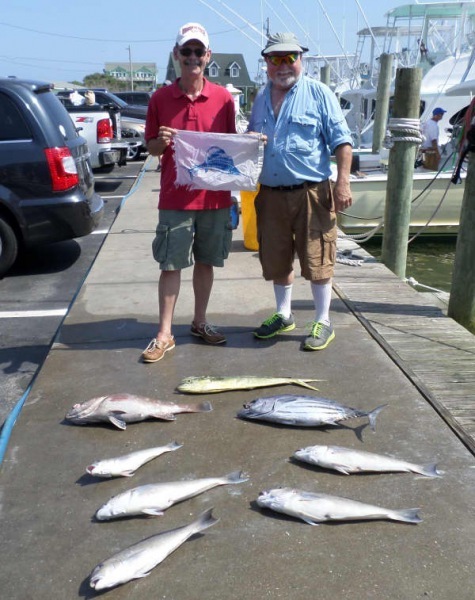 William Jordan of Moneta, VA: Sailfish release on Release. 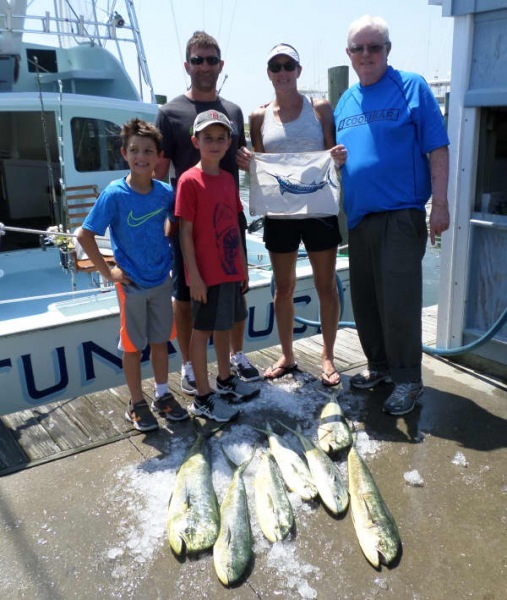 Belinda Lazzara of St. Petersburg, FL: Blue Marlin release on Tuna Duck. Ashlyn Bell of Durand, MI: 36 lb. Dolphin on Hatteras Blue. Corey Pearce of Gaithersburg, MD: White Marlin release on Calypso. Excellent Gaffer Dolphin fishing with good numbers of bailers as well. Not much else on the menu today other than triggerfish and Grouper. Congrats to Release for the first Grand Slam of the year! (Blue Marlin, White Marlin, Sailfish). Sundown released a Sailfish. 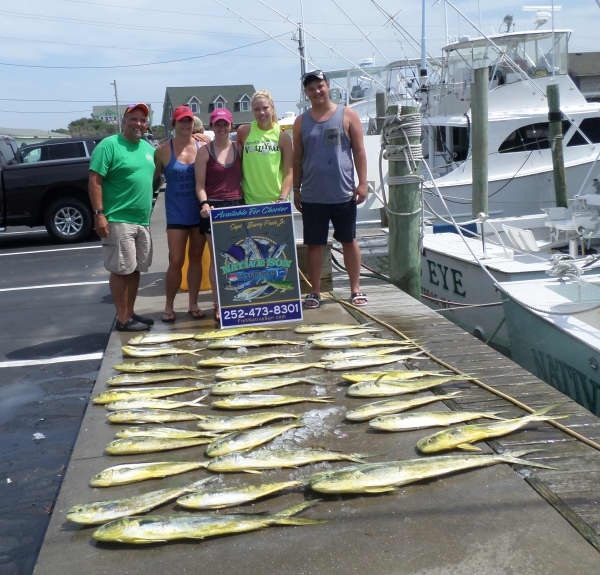 Inshore boats were catching Spanish Mackerel, Cobia and big Red Drum releases. 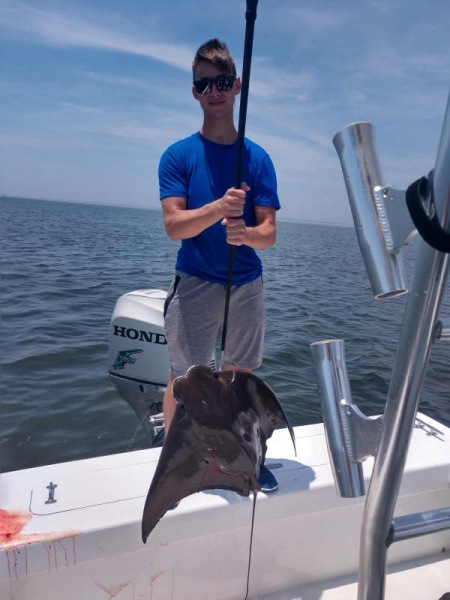 We had some Anglers bowfishing today and they were happy to get some Southern Rays and Cownose Rays to take home to eat. Sundown: Shantel Peters of Big Lake, MN released a Sailfish. Release: Owen Woodward of Winchester, VA released a Sailfish. 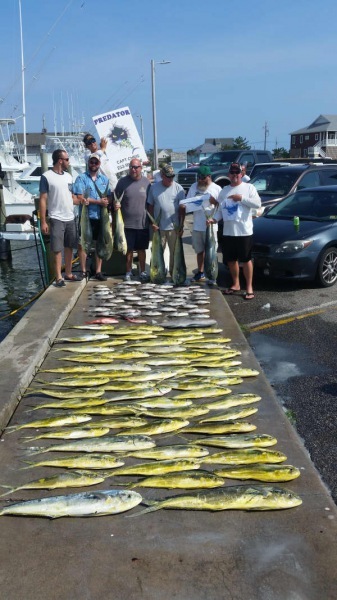 Justin Shockley of Chesapeake, VA released a White Marlin. Frederick Keys of Bluemont, VA released a Blue Marlin. Sound Bound: Timothy Conover of Northampton, PA released a 47" Red Drum. Scott Lovick of Newark, DE released a 47" Red Drum. 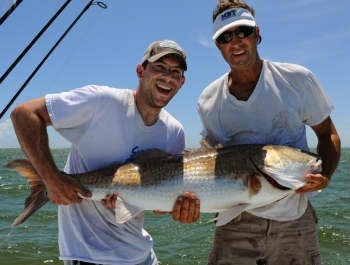 Anthony Conover of North Brunswick, NJ released a 47" Red Drum. Fewer boats out fishing today but they excellent catches of Gaffer and Bailer dolphin. 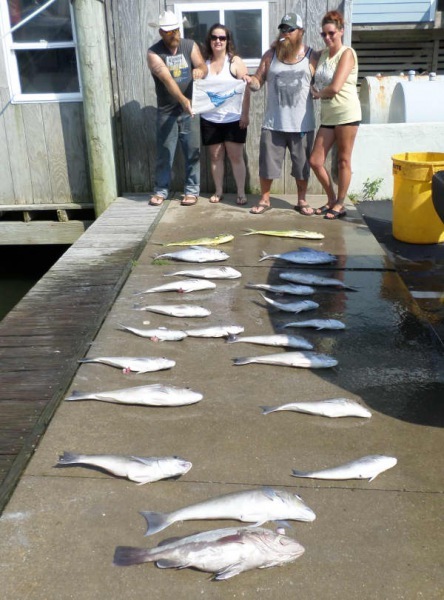 Triggerfish and Grouper also put in a good showing. Carolina Girl released a Sailfish. 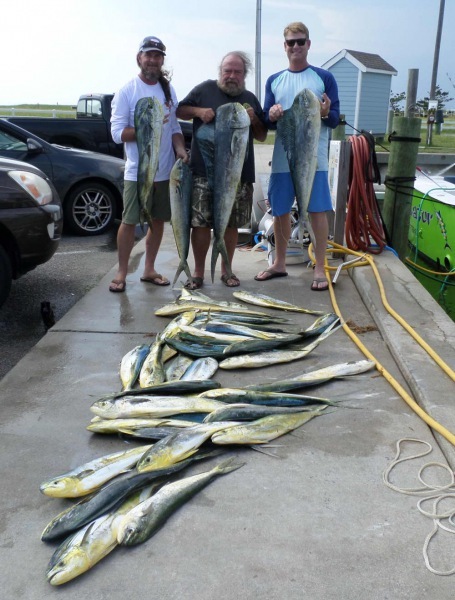 Inshore boats were on the Spanish Mackerel today pulling spoons and bringing them in the boat. It's a great trip for kids or beginners to get their feet wet. 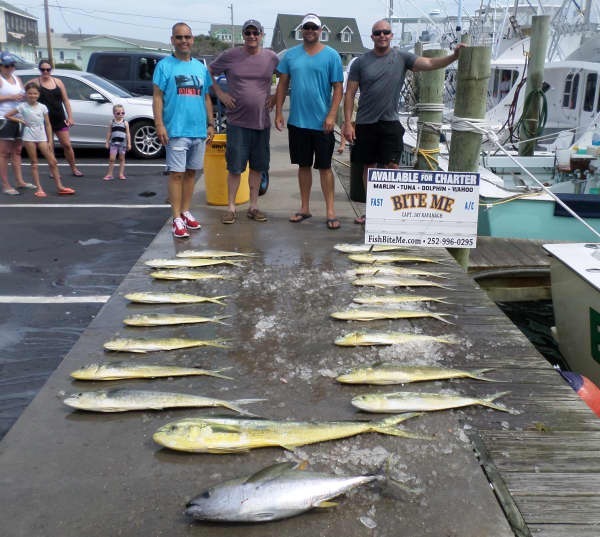 There were also catches of Bluefish a few keeper Red Drum and some big schools were seen. Carolina Girl: Michele Kincaid of Eagle Rock, VA released a Sailfish. Gorgeous day with blue skies and a light wind. Temps in the 80's today and the majority of our fleet is out fishing. Late afternoon wind picked up with some cooler temps and overcast sky. 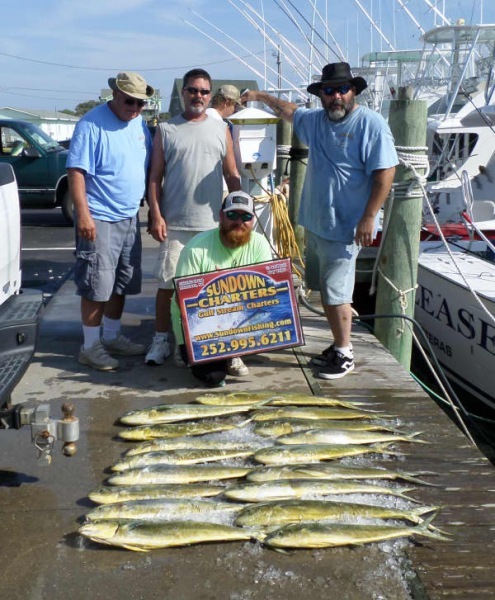 Inshore boats were again having phenomenal Spanish Mackerel catches. 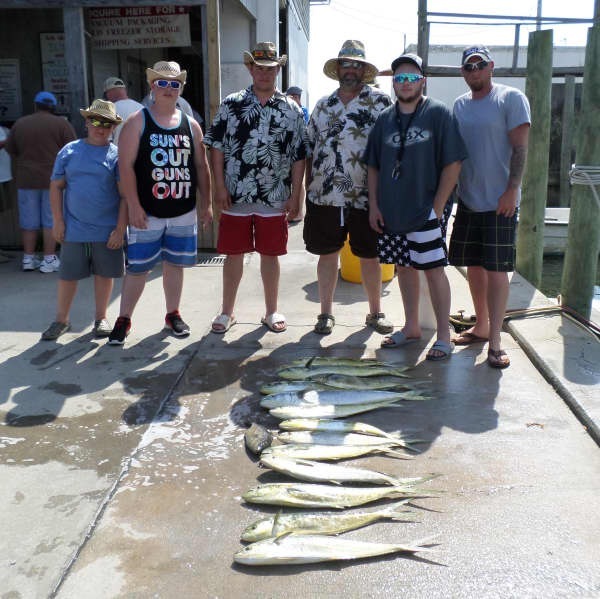 Offshore boats continued to have good gaffer and bailer Dolphin with some Tilefish and Amberjack. 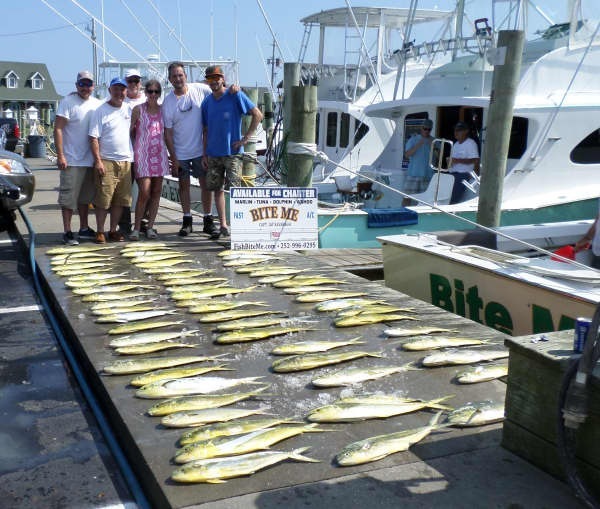 Sea Creature released a White Marlin and Predator released two Sailfish. Predator: Jarrad Stephens of Suffolk, VA released a Sailfish. James Owens of Virginia Beach, VA released a Sailfish. Sea Creature: Andrew Harper of Clemmons, NC released a White Marlin. Another gorgeous day to be out on the water. 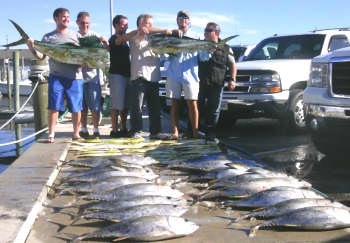 Once again our fleet stayed busy all day sporting anglers out to the fish! 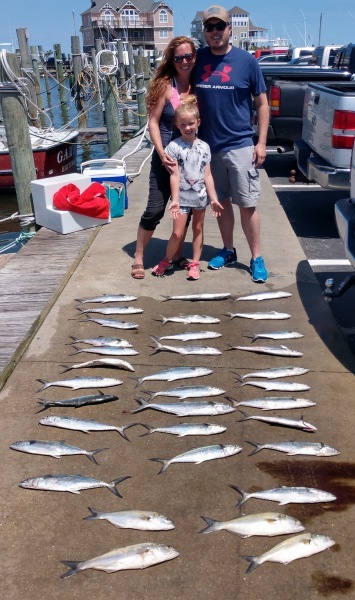 This morning brought good catches of Spanish Mackerel in the Pamlico Sound. 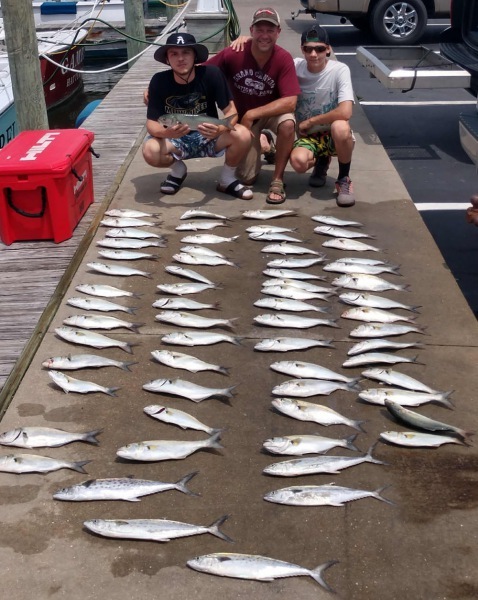 The afternoon anglers located big schools of citation Drum, caught some Puppy Drum, and topped that off with a nice catch of Bluefish. 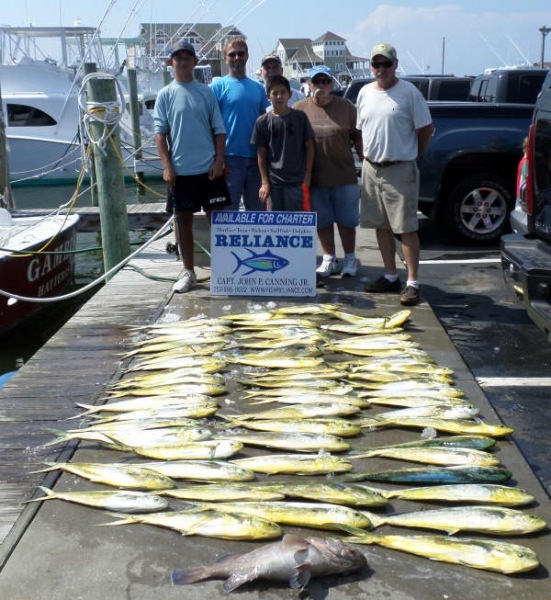 Offshore anglers kept busy catching limits of Dolphin. 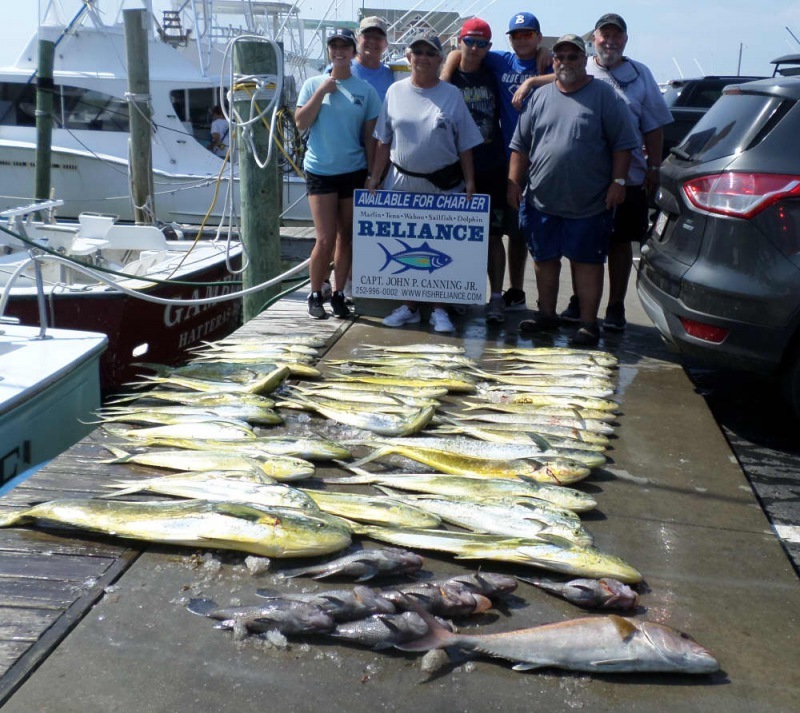 The Blackfin Tuna bite was fair and bottom fishing produced Tilefish and Grouper. 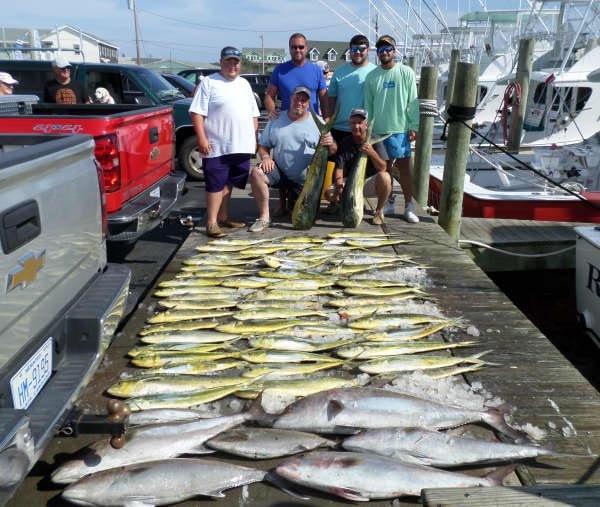 Two Blue Marlin were caught on the last day of the Big Rock Tournament by Hatteras Fever II. One was released and one was boated. We are currently waiting on the results of the weigh-in at Morehead City. Check out their live webcam on their website. Richard McBee of Mannasas, VA: 36 lb. Dolphin on Reliance. John Haddock. Sr. of Davidson, NC: 45" Red Drum release on Tightline. 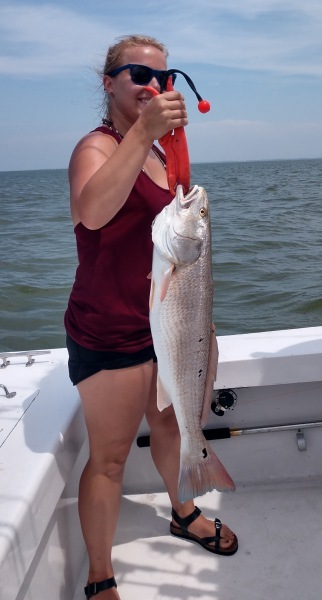 Marcia Haddock of Davidson, NC: 46" Red Drum release on Tightline. John Haddock, Jr. of Davidson, NC: 46" Red Drum release on Tightline.